SUNDAY: Wieters told Dan Kolko of MASNsports.com and other reporters on Sunday that his surgery was to remove a tendon. Wieters believes he could return within six to eight weeks. THURSDAY: Nationals catcher Matt Wieters has undergone surgery on his left hamstring, per a team announcement. Wieters had already gone on the DL, so no immediate roster moves will be required. The big question is what kind of rehabilitation timeline will be necessary. Further details are not yet available, but it certainly does not appear to be promising news for the veteran backstop, who had previously only been diagnosed with a strain. Clearly, this is not a typical hamstring injury that requires only rest and rehabilitation. Wieters, who is nearing his 32nd birthday, has not exactly overwhelmed since joining the Nationals in advance of the 2017 campaign. But he had been a useful player in the early going this year, reversing his struggles at the plate by carrying a .231/.342/.385 batting line with ten walks against a dozen strikeouts. 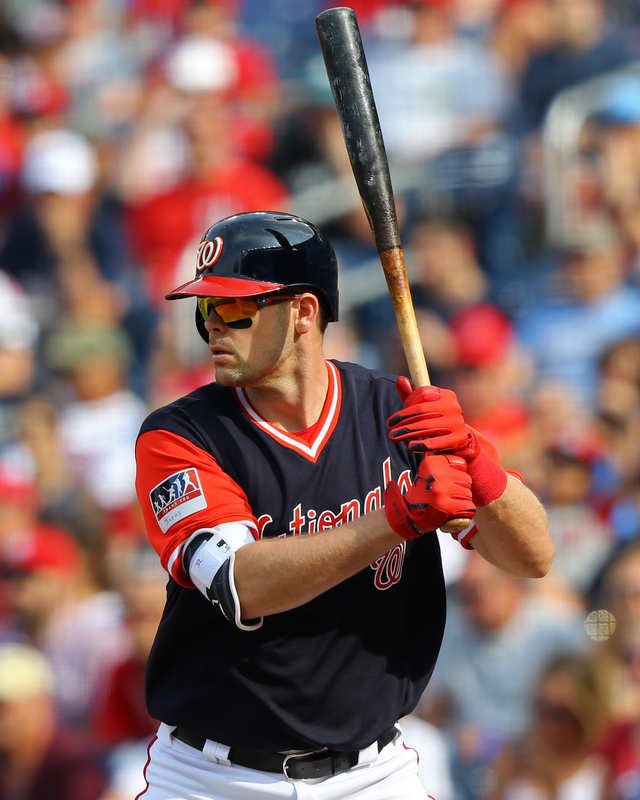 Even if the Nats have cause to believe Wieters could return at some point during the current season, it now seems likelier than ever that an outside addition will be needed. Spencer Kieboom is currently backing up newly-minted starter Pedro Severino at the position for the time being. While both are considered defensively proficient, they’re also thin on MLB experience and neither has shown much hitting capability in the upper minors. Suspended youngster Raudy Read will be available again before too long, though the preference will likely be to get him back in the swing of things in the upper minors. For the Nationals, there’s also a longer-term need to consider. Wieters is earning $10.5MM this season before returning to the open market. While Severino ought to represent a reserve or platoon piece for some time, he does not profile as anything approaching an everyday backstop. Read perhaps offers greater upside with the bat, but is hardly a can’t-miss prospect. There are a variety of hypothetical options out there for the Nationals, who’ll likely find it difficult to make a substantial upgrade until closer to the trade deadline. Bringing in a player such as Miguel Montero, who opened the season in D.C., could help bridge the gap. And it’s conceivable the Nats could give Blake Swihart a crack, as MLBTR’s Steve Adams noted yesterday, though they’d have to believe more in his capabilities behind the dish than do the Red Sox. It also may just be that the Nationals will prefer to roll with what they have for a bit while seeking to boost the depth at Triple-A. Looking ahead a bit to the deadline, J.T. Realmuto remains the obvious prize, as we explored recently in a post. But he’ll be widely pursued and figures to cost a significant haul in prospect value. Old friend Wilson Ramos is among the potential rental assets the Nationals could consider, but he and others likely won’t hit the block unless and until the Rays and other organizations decide to pack it in for the season. As expected, the Nationals have placed catcher Matt Wieters on the 10-day DL with a hamstring strain. He’ll be replaced on the active roster by backstop Spencer Kieboom, as the Talk Nats blog first reported on Twitter. While Kieboom was previously on the Nats’ 40-man, he was bumped off the roster last spring. The Nats have selected his contract again to facilitate his move back to the active roster. At this point, it’s still unclear just what sort of absence the Nats ought to expect from Wieters. The injury has been announced as being to his hamstring, but there was some concern his knee may have incurred damage. It is not known at this point whether the joint is still an area of concern. The 27-year-old Kieboom, who’s the older brother of Nats prospect Carter Kieboom, drew a walk in his lone prior MLB plate appearance. He has not hit all that much in the upper minors — his .250/.337/.333 slash thus far in 2018 is representative — but does possess solid plate discipline and contact skills (lifetime 8.4% walk rate and 19.2% strikeout rate). Kieboom has long been regarded as a quality defender, too, so he’s a suitable option at least for fill-in duty. Whether or not Wieters is shelved for a significant time, the Nationals’ questions behind the dish are only getting more pressing. The club is now facing some firm challenges from within the NL East while dealing with the absences of Murphy and Eaton. Though both Wieters and now-starter Pedro Severino have produced at approximately league average offensively to this point of the season, there’s reason in both cases to suspect the output will lag over the course of the season. While the team will surely also be looking for pitching depth at the deadline, the situation behind the plate stands out as being the other area of the roster ripest for upgrade. That’s all the more true since Wieters is set to depart after the current season, meaning the Nats still need to find a near and long-term solution. Matt Wieters sustained a leg injury when rounding first base after hitting a single and will undergo an MRI this morning, writes Chelsea Janes of the Washington Post. It’s not clear if the damage is specific to his hamstring or something in his knee. Wieters told reporters that he felt something “behind [his] knee, kind of go a little bit.” The veteran switch-hitter has been more productive so far in 2018 than he was in 2017, hitting .231/.342/.385 through his first 76 plate appearances. While he’s still not the hitter he was in his best years with the Orioles, the loss of Wieters for any period would put the Nationals in a bind. He’s one of just two catchers on the 40-man roster now that the Nationals released Miguel Montero last month and placed Jhonatan Solano on the 60-day DL (depth chart). Either journeyman Tuffy Gosewisch or longtime Nats farmhand Spencer Kieboom seem likely to have his contract selected from Triple-A this weekend, as Janes notes that Wieters has already been deemed unavailable for tonight’s game and will “almost certainly” land on the DL for a second time this season. Outfield prospect Juan Soto, perhaps the quickest rising star of any prospect early in the 2018 season, was bumped from Class-A Advanced to Double-A yesterday. The 19-year-old Soto opened the year in Class-A and was moved to Class-A Advanced after just 16 games. His stay in High-A only lasted another 15 games though, as Soto obliterated pitchers there before somewhat incredibly homering and hitting a double in last night’s Double-A debut as well. Soto has raked at an otherworldly .373/.477/.817 clip across three levels so far, belting 13 homers, nine doubles and four triples while walking more often than he’s struck out (26-to-21 BB/K ratio). The Pirates announced today that right-hander Joe Musgrove has been placed on the 10-day disabled list due to a muscle strain in his right shoulder. Righty Clay Holmes, who’d previously been returned to Triple-A after serving as the 26th man for yesterday’s doubleheader, has been recalled. (Holmes’ optional assignment needn’t be for the typical 10-day minimum, as he’s replacing an injured player.) As MLB.com’s Adam Berry notes, the move seemed somewhat curious at first, as Musgrove had said he felt good physically not long before the announcement. But testing ended up revealing a strain, leading to the roster move. The Nationals recalled catcher Pedro Severino from Triple-A and placed Matt Wieters on the disabled list with a “mild left oblique strain.” Chelsea Janes of the Washington Post first reported today that Wieters was dealing with some type of injury and that Severino was headed to Atlanta in the event that Wieters needed a DL stint (Twitter links). Janes noted that Wieters didn’t take batting practice yesterday on his off day and “looked uncomfortable” throwing the ball back to the mound when catching warm-up pitches between innings for Nats starters. Both Wieters and Severino are coming off down seasons in 2017, as is Washington’s current backup, Miguel Montero. The Mariners are leaning toward placing Nelson Cruz on the 10-day disabled list so they can have a full bench for their upcoming interleague series, manager Scott Servais said today in an appearance on Brock & Salk on 710 ESPN in Seattle (Twitter link via 710’s Brent Stecker). Cruz suffered an ankle injury when slipping on the dugout steps after a two-run homer over the weekend and had an MRI, though the results of that test haven’t been announced yet. Marlins catcher J.T. Realmuto has progressed to the point where he’s been cleared to resume catching drills, tweets MLB.com’s Joe Frisaro. However, Frisaro cautions that Realmuto will probably still require “a few more weeks” before he’s able to return from the lower back injury that landed him on the disabled list to open the 2018 campaign. Chad Wallach, Tomas Telis and Bryan Holaday have been doing the catching in Realmuto’s absence. The Yankees announced today that they’ve voided right-hander Ben Heller’s optional assignment to Triple-A Scranton/Wilkes-Barre and instead placed him on the Major League 10-day disabled list with a bone spur in his right elbow. There’s no immediate timetable provided for Heller’s return, though he’ll benefit from being on the MLB disabled list instead of the minor league DL, as he’ll now gain big league service time (and be paid the pro-rated portion of the league minimum) while sidelined. 3:28pm: The Athletics are nearing agreement with Lucroy, per ESPN.com’s Jerry Crasnick (via Twitter). 3:14pm: The Athletics are pursuing a veteran catcher and expect to acquire one, per MLB.com’s Jane Lee (via Twitter). Specifically, the club anticipates either signing Jonathan Lucroy or acquiring Matt Wieters from the Nationals. Lucroy remains one of the top remaining un-signed free agents. He entered the winter as the top-rated catcher available. Needless to say, the latter possibility hints at the potential for lots of creative trade scenarios — especially given the long trade history between these organizations’ current front office leadership. The Nats owe Wieters a hefty $10.5MM salary after his poor 2017 season. At the same time, the team would surely only move him (and as much of the salary as it can) if it has an upgrade lined up. Of course, it could be that the Nats would see Lucroy himself as a preferable option to Wieters, adding yet another potential dimension to the situation. Lucroy entered the winter emphasizing his desire to play for a competitor, after all. Washington has also long been tied to quality young Marlins receive J.T. Realmuto, though it’s not clear whether there has been any recent movement on that front. At this point, though, the trade possibilities are all speculation. The Orioles seem to be casting a wide net in their hunt for starting pitching, as they have been cited as having interest in quite a few arms already. While the organization has become known for doing a good portion of its business later in the offseason, perhaps it’ll be more aggressive on some pitchers this time around. In any event, the latest name connected to the O’s is righty Alex Cobb, with Jon Morosi of MLB Network tweeting that the team has interest in a hurler who long tormented them in the division. Cobb won’t come cheap, but could be an option if Baltimore decides it’s able to add a more significant contract. The primary goal, though, will be to ensure there’s enough depth on hand in the rotation. The Mets are the current poster child for the concept that you can never have enough pitching depth. Even on the heels of a tough season in which the club’s vaunted rotation collapsed, though, GM Sandy Alderson says he’ll consider dealing arms, as Mike Puma of the New York Post reports. While there’s still a need to “be careful” not to thin the staff out too far, Alderson is obviously also looking for ways to improve with a limited amount of payroll flexibility. Odds are that the team’s most prominent pitchers won’t be dangled, but Puma suggests Robert Gsellman, Seth Lugo, or Rafael Montero might conceivably be discussed. While there’s nothing the Nationals can do to get out from under their 2018 commitment to Matt Wieters, the team will look for ways to improve behind the plate. Jorge Castillo of the Washington Post writes that the plan is to reduce the veteran’s role. Of course, that would mean relying more heavily on another player, and the team’s top internal alternatives (Pedro Severino and Raudy Read) are hardly sure things. An external acquisition will surely at least be considered; I ran through some other possibilities after the Nats were bounced from the postseason. The Blue Jays are aiming for depth in their pitching staff, Ben Nicholson-Smith of Sportsnet.ca writes. Lefty Robbie Ross is among the arms they are interested in, he reports. Certainly, Toronto has had a chance to see Ross up close over the past several years, which he has spent with the Red Sox. He was limited by injury in 2017 but turned in 55 1/3 innings of 3.25 ERA pitching in the prior campaign. Toronto isn’t limiting itself to lefty relievers, though; Nicholson-Smith says the club is looking at basically every type of hurler out there. Marc Topkin of the Tampa Bay Times has the latest on the Rays’ efforts to land a new ballpark. Owner Stuart Sternberg expressed optimism about a prospective site in Hillsborough County, but there are plenty of challenges still to be dealt with. Among them: the club “might only cover $150 million of the projected $800 million cost,” Topkin writes. Those interested in learning more about where things stand will want to give the link a full read. NOV. 6: The Nationals have now formally announced that Wieters has exercised his player option. 4:44pm: Wieters will indeed exercise his player option to remain with the Nationals, the Washington Post’s Chelsea Janes reports (Twitter link). NOV. 4, 8:19am: It “is not at all a done deal” that Wieters exercises his option, Chelsea Janes of the Washington Post tweets. The catcher has yet to make a decision in either direction. NOV. 3, 1:05pm: Agent Scott Boras tells Feinsand that Wieters is still mulling the decision (Twitter link). “What he does for a pitching staff is off the charts & in great demand,” Boras tells Feinsand. 12:20pm: Matt Wieters intends to exercise his $10.5MM player option and remain with the Nationals in 2018, reports MLB.com’s Mark Feinsand (on Twitter). It’s not a surprising move for Wieters, considering the poor season he had in his first year as the Nationals’ primary backstop. The 31-year-old Wieters inked a two-year, $21MM guarantee with the Nats last offseason, with the latter year of that contract coming in the form of a player option. However, Wieters posted career-worst marks in batting average, on-base percentage, slugging percentage and caught-stealing rate with the Nats this season, so it’s seemed all but certain that he’d forgo another chance at free agency for quite some time now. Overall, Wieters batted just .225/.288/.344 with 10 homers through 465 plate appearances. He halted 25 percent of opposing stolen-base attempts, which is only slightly below the league average but is also well south of the career 33 percent mark he carried into the 2017 season. He also rated as one of the game’s bottom pitch-framing catcher, per Baseball Prospectus. Even with Wieters back in the fold, it’d be a surprise if the Nationals didn’t pursue help behind the plate this offseason. Young Pedro Severino is the team’s top internal alternative, but the 24-year-old Severino batted just .241/.292/.332 in 59 Triple-A games last season. Given the Nationals’ status as clear-cut contenders — especially in their final season of control over Bryce Harper — GM Mike Rizzo seems unlikely to head in the year with such a glaring question mark on his roster. Myriad trade opportunities could present themselves, and it’s also possible (speculatively speaking) that the Nats could make a run at either Alex Avila or Welington Castillo — the top two catchers on the open market. Avila, in particular, strikes me as a logical candidate; he can play some first base in the event of an injury to Ryan Zimmerman, and his left-handed bat would pair well with Wieters, who has consistently been a more dangerous right-handed hitter than left-handed hitter throughout his Major League career. Matt Wieters will return to Baltimore tonight for the first time since signing with the Nationals, and he spoke with Dan Connolly of BaltimoreBaseball.com about his offseason departure from the Orioles as well the emotions he’s feeling in advance of tonight’s return to Camden Yards. Wieters’ podcast appearance also included talk of Dylan Bundy’s breakout and the experiences he’s had when being managed by two of our generation’s most successful managers: Buck Showalter and Dusty Baker. Though Rickie Weeks has gotten off to a dreadful start to his 2017 campaign with the Rays, the “clock isn’t ticking yet,” writes Marc Topkin of the Tampa Bay Times. It doesn’t appear that Weeks is on the brink of losing his roster spot, despite an ugly .163/.317/.286 batting line to open the season, though Topkin notes that he’ll need to turn things around sooner rather than later. Topkin also notes that the Rays face a decision when Matt Duffy returns from the disabled list late this month. Duffy is in line to be the starter, but the Rays will have to determine if Tim Beckham or Daniel Robertson is the better option to serve as a utility option. Both Aaron Sanchez and the Blue Jays were encouraged by a 33-pitch bullpen session yesterday, writes Sportsnet’s Ben Nicholson-Smith. Sanchez felt comfortable enough to throw his curveball — the same pitch that has led to the blister issues and a subsequent removal of part of his fingernail — and is now slated to pitch in an extended Spring Training game on Tuesday. If that outing goes well, he’ll be an option to return to Toronto’s rotation this weekend against the Mariners, per Nicholson-Smith. Hanley Ramirez has yet to appear in a game at first base this season due to a shoulder issue, but he’s ready to take the field for the Red Sox’ upcoming interleague series in Milwaukee, writes Jason Mastrodonato of the Boston Herald. That should allow the Red Sox to deepen their lineup against left-handed pitching, he points out, with Chris Young sliding into the DH slot and Ramirez playing at first over the left-handed-hitting Mitch Moreland. While Moreland has more than held his own against southpaws in a small sample of work this season (.879 OPS in 24 plate appearances), he’s struggled against lefties throughout his career. And, as manager John Farrell points out to Mastrodonato, Moreland isn’t accustomed to playing first base on an everyday basis (due largely to his platoon issues), so the ability to keep him fresh by mixing Ramirez in at first base is important in multiple regards.